Just B Au Naturel's Wellness Body Oil is praised as the Beauty Secret of the Geishas. Camelia has been recognized for centuries for its high skin restorative and rejuvenating abilities. Camellia Oil is the most easily absorbed of all natural oils and can penetrate into the deepest layers of the skin without leaving skin oily. Selected for their high concentration of essential fatty acids and nutrients, this lightweight and silky texture oil blends seamlessly into the skin. 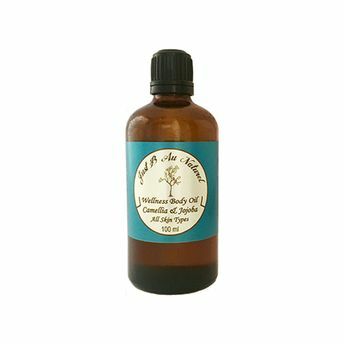 The wellness body oil protects skin from drying out while replenishing vital nutrients. It smoothes rough and flaky skin, soothes and calms easily irritated skin, and helps repair sun damage. Recommended for mothers-to-be and new moms.